Vail has some of the best snowmobiling in Colorado, so spend a day off the ski hill on a high-speed adventure through forested trails, open meadows and alpine bowls choked with champagne powder. This working ranch turned vacation destination partners with local outfitters to provide exciting summer and winter tours & activities. Colorado Backcountry Rentals is an unguided snowmobile/ATV rental operation in the Vail Pass Recreation Area based in the town of Red Cliff, Colorado.experience. Your take and ride specialist. We provide the machines, equipment and maps, you take the adventure of your life! Delivery available to some locations. Whether its snowmobiling Colorado, or ATV rentals in Colorado that you're looking for, we've got you covered. Fun for all seasons and interests. In summer try: rafting, sporting clay shooting, atv tours, tubing. In winter: snowmobile, winter guided atv tours. 1.5 & 2.5 hour snowmobile tours include: experienced guide, hot drink and snack. Complimentary transportation from Vail, Beaver Creek & Avon. Colorado’s highest snowmobile tour company. From a two hour groomed ride with incredible vistas to high performance powder field slashing, we have it all. Come join us! Gun the throttle through a powder-filled meadow on a Vail Colorado snowmobiling trip, where high-octane adventure awaits in picturesque backcountry locales. The two areas most conducive to Vail snowmobiling are Vail Pass and Camp Hale, both located within the White River National Forest about a half-hour from Vail. Vail Pass Winter Recreation Area (Map PDF) offers easy access to 50 miles of groomed high-elevation trails, while Camp Hale boasts beginner and intermediate circuits on its 80 miles of groomed trails. Both destinations have seemingly endless play areas and powder fields. 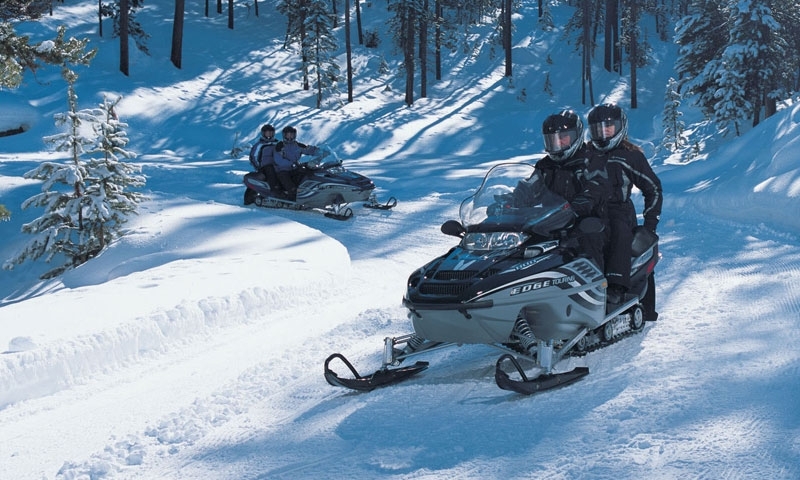 Hourly snowmobile rentals start at $90, half-day at $175 and full-day at $220. Get the kiddies snowmobiling on specially designed sleds for kids five years and older: $15 for 15 minutes and $55 for 60 minutes. Guided tours ranging from one hour to all day leave daily from December through April (conditions permitting) and cost $100-375 per sled. Offering a general directory for snowmobile shops, trails, and local snowmobile clubs. Snowmobile rental, tours and information for Crested Butte, Colorado.